I started this blog in 2008 when I exited from Ventyx after an eight year run as division president for its Global Energy Advisors division. I created Scalable Growth Strategy Advisors to focus on the disruptive innovation technology and global competition that are transforming the energy industry. My clients were mostly software, data and technology companies asking themselves the same transformation questions—what is going on and how do I keep it from eating my lunch? Starting a new business just as the Great Recession was crashing everything around us ironically lived into the disruptive innovation chaos I was telling my clients we faced as the energy industry responds to the volatility of the markets, the looming global competition from China and the regulatory demands for renewable energy, emissions reduction and smart grid. A Silicon Valley software company with substantial IP in legacy algorithms forced to find new growth drivers in a market where its legacy products were stalling. A New England energy research firm in a sweet spot of the energy value chain saw the chaos as an opportunity to ‘cash out’ with a sale to a strategic buyer but needed to sharpen its product strategy and roadmap to optimize its value proposition. A large global energy information company needed due diligence and product mapping help to sharpen the value creating opportunities and risks in a large transaction and find ways to use new technology to extract value from commodity data. A large utility slammed by a wave of regulatory and market changes needed ‘fresh eyes’ to define the business case for rate recovery for the transformational investment needed to position it for the changing market future its customer faced. By 2011, the worst of the recession was slowly passing, we hoped, and the themes driving our engagements always seemed to include disruptive change, global competition and their effects across the energy value chain. My blog ZAP CRACKLE POP combined with my digital resume and my Linked-In profile were my ‘starving start-up’ marketing strategy. One of the readers of my blog was a guy from Boston, Nathan Watt, who kept commenting on my blog rants. The back and forth discussion of ideas included dreams of a new company that focused on a new business model of collaboration, that saw real opportunities for great products to come together through collaboration to make even better end-to-end solutions impossible working separately, that saw disruptive change as an opportunity not a threat. Nate and I also have two fellow board members named Daniel who help keep us grounded. Daniel Jackson is our General Counsel and IP Jedi Knight. Dan Keldsen, serial entrepreneur and technology and social media guru, partner in Human 1.0, Co-founder at Level 50 Software, and President, Information Architected, Inc provides adult supervision in our sandbox and forces us to stop having so much fun and stay focused on biz. Out of that give and take, Tech & Creative Labs or TCLABZ was born. Scalable Growth Strategy Advisors has been rolled-up into TCLABZ. ZAP CRACKLE POP is morphing into TCLabzTrends to give voice to our ideas and insight and share our journey of collaborative product development, fast to market solutions and focus on scalable growth from disruptive innovation technologies applied to the customer pain points of the energy future. We are doing the hard work of INTEGRATION first to create platforms that are focused, agile, efficient and elegant in their user friendliness. We are doing it COLLABORATIVELY with our partner companies because it is in the best interests of the partners to work together for scalable growth sharing best in class components rather than re-inventing the wheel. We are BUILDING SOLUTIONS FOR THE ENERGY FUTURE to meet the dynamic, changing needs of market participants in a future they are only beginning to define. Traditional power market analysis often was done as bespoke consulting. In 2000, at Henwood Energy Services we pioneered a new approach to analytics best practices creating a un-conflicted, consistent, transparent power market and fuels reference case forecast product for every NERC region in North America. The product was a big hit with clients and enabled the software products used to create these forecasts and asset valuations to scale their growth more quickly becoming market leading solutions. Today products like this are still good but no longer sufficient for where the energy market is going. Today the market still needs fundamental analysis, but it also needs performance based predictive analytics to address the transformational needs at work from increasing complexity and the pace of rapid change from smart grid, renewable energy, global competition and the policy uncertainty about greenhouse gas emissions reduction policies. Today crowdsourcing extracts insight from semantic and temporal analysis of big data and across the energy value chain to leverage the ‘wisdom of the crowd’ to inform decisions from dynamic market interactions in near real-time. 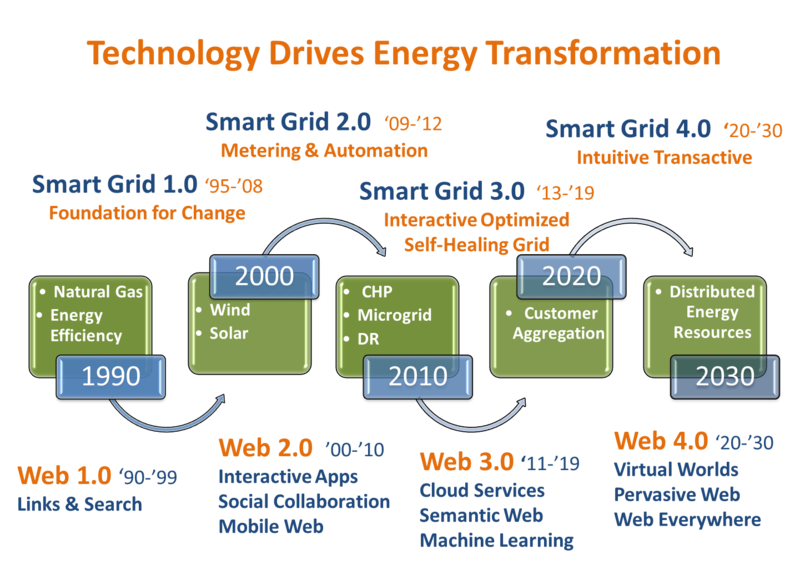 Disruptive innovation technology is changing energy market and risk analysis. We still use traditional zonal production cost models for power market fundamental analysis and price formation. We still use nodal power flow models of transmission and congestion to assess the location margin price of moving power from point A to point B. But today we do more than that. As the price of performing advanced pattern analysis, entity extraction, data visualization, artificial market simulation comes down, and software flexibility goes up, temporal and locational analysis, the analysis of upstream data both structured and unstructured can perform predictive analytics, power dashboards, map value chain flows and turn big data into no big problem. The truth is Nathan Watt and Gary Hunt are perfect business partners. Gary lives at the bleeding edge of energy markets and creative chaos of technology and helps his business customers deal with their pain points by leveraging these disruptive innovation technologies and applications to solve business problems, change the value proposition and disintermediate the conventional wisdom to create value and opportunity in rapidly changing energy and information markets. In our TCLABZ world of disruptive change Gary is the product champion, architect and strategic thinker and Nate is the “how the hell am I going to build that” rational genius of collaboration, business process, partner development and sales management that is turning strategies into actionable products. The rate of change of disruptive, low cost analytics solutions is accelerating. TCLabz is focused on applying high power, low cost analytics solutions across the energy value chain not to replace fundamental analysis to but make it faster, better, cheaper and more user-friendly. Think of it as real time energy business intelligence and dynamic predictive analytics as embedded technology across the energy enterprise benchmarked against global energy competition for fuels, regional energy market fundamentals, technology learning curves and LCOE prices, and their impacts on end users or portfolio risk and on scalable earnings growth and profitability. The competitive advantage of dynamic predictive market analysis will be SPEED TO MARKET, AGILITY, and the ability to BRIDGE THE ENERGY VALUE CHAIN. Tech and Creative Labs seeks to turn the energy analytics process on its head by doing the integration FIRST through collaboration and partnering to create scalable growth platforms of insanely agile product capabilities massively integrated through crowdsourcing and community aggregation. We will offer customers solutions to target the energy future and scale their growth faster. Our platforms will increase the recurring revenue potential of our partner companies and by that AGILITY and INTEGRATION will increase the overall value of their business, give them the scale to compete in bigger deals, larger markets against giants. By focusing on platforms and then building ecosystems that layer partner product capabilities to solve business problems we create solutions that work, we unleash the creative potential of our clients and their people to put the passion back in their business. What are we selling at Tech & Creative Labs? We deliver and support platforms for real-time, dynamic energy information, market and portfolio analysis and insight across the energy value chain from advanced analytics embedded technologies seamlessly integrated unmatched by others. We offer dynamic crowdsource participation in expert communities to inform, challenge and extract insight on platforms continuously assessing changing energy market fundamentals, temporal, contextual, semantic energy value chain business intelligence, and insight into business strategies, risk and the actions of market participants across global regional markets. We empower you to imagine alternative business futures playing ‘what if’ across alternative industry scenarios, global or regional markets, across the energy value chain with the analytics and artificial market simulation tools to evaluate strategies and risks for your portfolio and its implications for your business. From the collaboration with our partners and the business pain points of our customers the product roadmap is shaping up fast. So watch this space and travel with us on this journey of disruptive innovation, collaboration and transformation @ work. This entry was posted in Business Models and tagged Dan Keldsen, Daniel Jackson, disruptive technology, Gary Hunt, Nathan Watt, TCLabs, TCLABZ, tech & Creative Labs. Bookmark the permalink.